We're thrilled to have Amanda Foody drop by to tell us more about her latest novel, ACE OF SHADES. Amanda, what was your initial inspiration for ACE OF SHADES? I had two very, very different ones. The first was the idea of a world where magic was currency, in which every book of the series had a different financial operation. The second inspiration came from Spirited Away, my favorite movie. I based the three core characters on Chihiro, Haku, and Yubaba. What scene was really hard for you to write and why? Is that the one of which you are most proud? There is a particular character in the book who is a predator, and though the writing never grows truly explicit, I still found his largest scene to be very unnerving to write. I am most proud of the female masturbation scene because of what it does for the character's arc and because I was so nervous to write it. I'm very happy with how it turned out. This book taught me nearly everything about writing. Most importantly, how to revise. This book has been entirely rewritten five times. What do you hope readers will take away from ACE OF SHADES? I hope readers love the characters and the world enough to return for book two! I don't think I could ask for more than that. I am the least picky writer ever. I have no ritual or preferences. I like constant change, and I don't like becoming dependent on any ritual or familiar thing. But it's a definite no to coffee shops. I don't like coffee, so I've truly only been inside coffee shops a handful of times ever. Seek out other writers who are at the same experience level as you or higher. Value their opinions on yourself and your work. Take compliments as easily as you take criticism. True self-confidence is letting go of perfection. A bunch of projects! Notably, finishing up ACE's sequel. 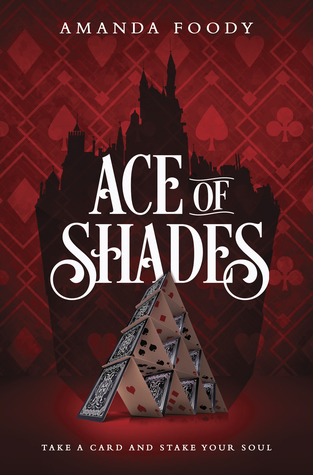 Have you had a chance to read ACE OF SHADES yet? Do you take compliments as easily as you take criticism? Are you able to let go of perfection? Share your thoughts about the interview in the comments!